The real perfect getaway vacation spot, a wide variety of the restaurants, daily entertainment and animation show.You will come as a guest and leave as a friend. The property is built on 63500 sq. meters and it has 333 deluxe rooms and suites with lavish landscape. These rates are intended for use by European nationals. Other nationalities are subject to additional charges levied at the time of check in. The hotel features 169 accommodation units. Guests of the hotel are welcomed in the lobby, which has a 24-hour reception and a 24-hour check-out service. Amenities include a safe and currency exchange facilities. Internet access and wireless internet access are available in the Reception area only. Gastronomic options include a restaurant, a café and a bar. Guests can visit the supermarket to purchase daily necessities. Shopping facilities are available. The grounds of the hotel feature a playground and an attractive garden. Guests arriving in their own vehicles can park in the car park at no extra charge. Among the additional services available are medical assistance, room service, a laundry and a hairdressing salon. A shuttle service is offered. These rates are intended for use by European nationals. Other nationalities are subject to additional charges levied at the time of check in. Dip into one of the 5 outdoor swimming pools or enjoy other recreational amenities including a complimentary water park and a sauna. This property also features complimentary wireless Internet access and gift shops/newsstands. The complimentary beach shuttle makes getting to the surf and sand a breeze. With a stay at The Three Corners Ocean View Hotel Prestige - Adults Only +16 in El Gouna, you'll be on the waterfront, within a 15-minute drive of El Gouna Beach and El Gouna Golf Club. This 4-star hotel is 24.2 mi (38.9 km) from New Marina and 24.5 mi (39.5 km) from Mahmya. Enjoy recreation amenities such as an outdoor pool or take in the view from a terrace. Additional amenities at this hotel include complimentary wireless Internet access, complimentary babysitting/childcare, and gift shops/newsstands. 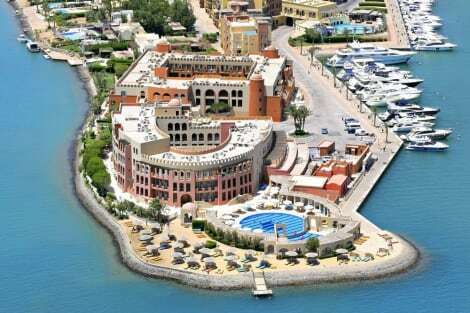 With a stay at Turtle's Inn in El Gouna, you'll be within a 10-minute drive of El Gouna Beach and El Gouna Golf Club. This hotel is 24 mi (38.6 km) from New Marina and 24.4 mi (39.2 km) from Mahmya. Make yourself at home in one of the 66 air-conditioned rooms featuring minibars and flat-screen televisions. Rooms have private balconies. Complimentary wireless Internet access keeps you connected, and cable programming is available for your entertainment. Private bathrooms with showers feature complimentary toiletries and hair dryers. Make yourself at home in one of the 152 air-conditioned rooms featuring LED televisions. Rooms have private furnished balconies. Complimentary wireless Internet access keeps you connected, and satellite programming is available for your entertainment. Bathrooms have showers and complimentary toiletries. Make yourself at home in one of the 115 air-conditioned rooms featuring minibars. Rooms have private balconies. Complimentary wireless Internet access is available to keep you connected. Bathrooms have showers and hair dryers. lastminute.com has a fantastic range of hotels in El Gouna, with everything from cheap hotels to luxurious five star accommodation available. We like to live up to our last minute name so remember you can book any one of our excellent El Gouna hotels up until midnight and stay the same night.